Philanthropy has had many impulses in recent years in a changing world. While some are ephemeral, others change the practice of philanthropy. In this perspective Swiss Philanthropy Foundation supports venture philanthropy initiatives, a real “laboratory” on how to practice philanthropy differently, particularly around the collaboration between philanthropists and the development of financial and economic tools for the benefit of the charitable sector. Venture Philanthropy is a new form of philanthropy that adapts the principles of private equity (the selection and development of companies with high growth potential among others) to the needs of the charitable sector. This concept is developed today in part by the European Venture Philanthropy Association (EVPA), created in 2004. 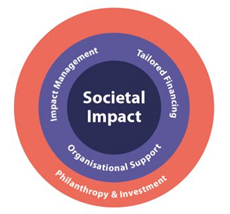 This network brings together a community of organisations that share the same vision and pursue the same mission: create a social and societal impact through venture philanthropy, in an entrepreneurial and committed approach to giving. The purpose of Swiss Philanthropy Foundation’s “Promoting Philanthropy” thematic fund is to encourage different ways of engaging in philanthropy. In this respect, the Foundation held conferences in Europe, in collaboration with the European Venture Philanthropy Association and the King Baudouin Foundation in Belgium. The 9th annual EVPA conference was organised in Geneva in 2013, initiated by WISE – philanthropy advisors alongside seven other foundations. This is the largest meeting of venture philanthropy held in Geneva, whose purpose was to put the entrepreneur and the philanthropist at the heart of the discussions. The Spring of Philanthropy is an initiative of the King Baudouin Foundation in Belgium supported by Swiss Philanthropy Foundation, whose aim is to promote philanthropy in our society. Major themes of philanthropy were discussed to highlight innovative ideas and new practices that can inspire philanthropists to engage and address societal issues at the local, national, European or international scale. Swiss Philanthropy Foundation participated in the event “Investing for Impact“, organised on 24 April 2017 by the EVPA and the Center for Sustainable Finance and Private Wealth of the University of Zurich. This workshop enabled 15 innovative impact investment funds from eight different countries to meet with Next Gen,present their solutions and share their successes, opportunities and challenges. Swiss Philanthropy Foundation was represented by Sabrina Grassi, Director of Operations, in the panel “Managing Impact: Approaches, Challenges & Lessons Learnt”. The high-impact “Education & Employment” thematic fund of the Foundation was presented. Discover one of the EVPA members, the “ella fund”: a fund hosted by the Swiss Philanthropy Foundation. To learn more about the upcoming events, please visit the online agenda.